Established in 1966, Preferred Tool and Die brings experience, expertise, and innovation to your project. Located just outside of Grand Rapids, Michigan, Preferred Tool & Die is located near modern research centers and many pioneering companies. Just three hours from both Detroit and Chicago we are located conveniently to many of our customers and industry partners. Some of the most innovative companies in the world have chosen Preferred Tool & Die to team up with for the stamping and tool and die solutions. 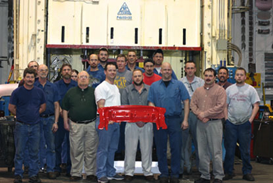 Preferred Tool and Die’s team brings a commitment to your success, your competitiveness, to your bottom-line. All of our team members use their expertise, experience and innovation to create ideas, products and service quickly that will help you deliver quality to your customers at a profit.